A James Island man is already prepared for the 2016 Christmas season due to the fact that he never took the lights off his house from last year. Jimmy Cochran struggled on Black Friday to find the Christmas decorations in his garage, but after four hours he finally remembered they were still on the house where he left them the year before. 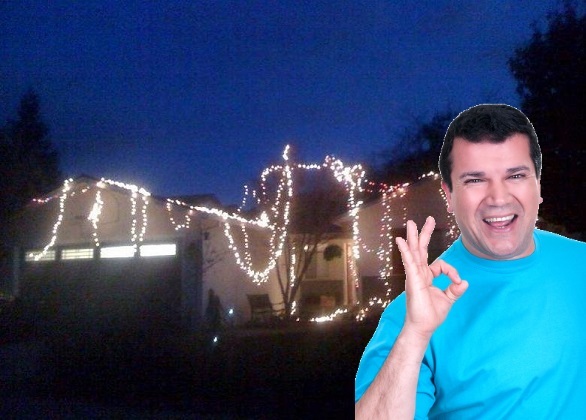 Much to the dismay of his neighbors, Jimmy’s Christmas lights have been clearly visible on his house since Black Friday 2015. Despite anonymous letters in the mail and many complaining threads on the neighborhood Facebook page, Jimmy simply forgot that they were there. Most neighbors hoped he would find them in the spring when he came out to do house maintenance, however, they underestimated Jimmy’s ability to sit for an entire year binge-watching Netflix and drinking cheap beer. Jimmy’s Christmas lights are expected to fail when he plugs them in for the first time since enduring outdoor weather for the last year. He’ll troubleshoot it for ten minutes before becoming frustrated and going inside his house to drink a Milwaukie’s Best Light tallboy can. Neighbor Natalie is expected to finally take down Jimmy’s Christmas lights when she puts her house in the market.